The Moving Picture Blog: Four more years! Four more years! 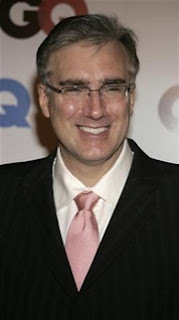 Keith Olbermann -- the only man in TV today who's a natural heir to Edward R. Murrow and Ernie Kovacs -- will have a steady gig at MSNBC (and some new duties at NBC) through 2011. Let joy reign supreme. Let there be dancing in the streets, drinking in the saloons and necking in the parks.